Microboards brand of disc duplication equipment. CFD-SD-07 Microboards SD/MicroSD Card Duplicators offer true standalone asynchronous operation regardless of the size of the master content! Available in 7, 11, or 15-slot configurations, users can make up to 15 copies at a time in a single system. CFD-SD-15 Microboards SD/MicroSD Card Duplicators offer true standalone asynchronous operation regardless of the size of the master content! Available in 7, 11, or 15-slot configurations, users can make up to 15 copies at a time in a single system. HCL-8000 For unattended disc duplication runs, let the Microboards HCL autoloader handle the work load with its state-of-the-art robotic arm and eight drives. DVD PRM PRO-1016 Microboards' Premium DVD Copiers feature high-speed, industrial NEC recorders that copy both DVD and CD formats. In addition, Microboards' Tower duplicators use a unique high-quality controller available only through Microboards. That's why Microboards always supports the latest record speeds and has the best track record in the industry! QD-DVD-123 New from Microboards! An economical, 1-to-3 DVD copier that burns DVDs at 24X speed and CDs at 48X Speed! QD-DVD-125 New from Microboards are the economical DVD copiers that burn DVDs at 24X speed and CDs at 48X Speed! The QD-DVD-125 is a one-to-five DVD/CD copier modeled after the popular QD-DVD-123. QD-DVD-127 New from Microboards are the economical DVD copiers that burn DVDs at 24X speed and CDs at 48X Speed! The QD-DVD-127 is a one-to-seven DVD/CD copier modeled after the popular QD-DVD-123. HCL-4000 Microboards Automated High Volume HCL-4000 with 4 drives. For unattended disc duplication runs, let the Microboards HCL Autoloader handle the work load. With a state-of-the-art robotic arm. QD-DVD The QD-DVD is a one to one DVD-R, +R/CD-R duplicator. The QD-DVD is a standalone duplicator that will record a full 4.7 GB DVD in about 6.5 minutes and will duplicate Dual Layer (DL) DVD discs. QD-DVD-1210 Looking for an affordable option to bring disc burning in house? Whether you're looking for a 1-to-1 duplicator for making just a couple discs or need a high-volume solution for a service bureau producing hundreds of discs a day, the Microboards QD Series duplicators are configured for your throughput requirements. QD-DVD-H123 Looking for an affordable option to bring disc burning in house? Whether you're looking for a 1-to-1 duplicator for making just a couple discs or need a high-volume solution for a service bureau producing hundreds of discs a day, the Microboards QD Series duplicators are configured for your throughput requirements. Available in 1, 3, 5, 7, or 10 recorder configurations with CD+G support, there's a QD series tower that will fit your needs. QD-DVD-H125 Looking for an affordable option to bring disc burning in house? Whether you're looking for a 1-to-1 duplicator for making just a couple discs or need a high-volume solution for a service bureau producing hundreds of discs a day, the Microboards QD Series duplicators are configured for your throughput requirements. Available in 1, 3, 5, 7, or 10 recorder configurations with CD+G support, there's a QD series tower that will fit your needs. QD-DVD-H127 Looking for an affordable option to bring disc burning in house? Whether you're looking for a 1-to-1 duplicator for making just a couple discs or need a high-volume solution for a service bureau producing hundreds of discs a day, the Microboards QD Series duplicators are configured for your throughput requirements. Available in 1, 3, 5, 7, or 10 recorder configurations with CD+G support, there's a QD series tower that will fit your needs. QD-DVD-H1210 Looking for an affordable option to bring disc burning in house? Whether you're looking for a 1-to-1 duplicator for making just a couple discs or need a high-volume solution for a service bureau producing hundreds of discs a day, the Microboards QD Series duplicators are configured for your throughput requirements. CFD-USB-15 Copy USB thumb drives in a flash with the Microboards CopyWriter USB Flash Duplicators. Making copies with the CopyWriter Flash Duplicator is easy; simply insert your master thumb drive, fill the remaining slots with blank devices, then press the OK button. Copying commences! QD-BD-H4 Copy Blu-ray Discs one at a time or by the thousands with the all-new QD Series Blu-ray duplicator towers. The 8X Blu-ray Disc duplicator towers have the ability to do more than just BD-R and BD-RW. Also copy CD-R(W), DVD-R(W), DVD-R DL DVD+R(W) all on the same system. QD-BD-H7 Copy Blu-ray Discs one at a time or by the thousands with the all-new QD Series Blu-ray duplicator towers. The 8X Blu-ray Disc duplicator towers have the ability to do more than just BD-R and BD-RW. Also copy CD-R(W), DVD-R(W), DVD-R DL DVD+R(W) all on the same system. 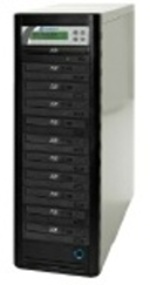 QD-BD-H10 Copy Blu-ray Discs one at a time or by the thousands with the all-new QD Series Blu-ray duplicator towers. The 8X Blu-ray Disc duplicator towers have the ability to do more than just BD-R and BD-RW. Also copy CD-R(W), DVD-R(W), DVD-R DL DVD+R(W) all on the same system. DVD PRM PRO-316 Microboards' Premium DVD Copiers feature high-speed, industrial NEC recorders that copy both DVD and CD formats. In addition, Microboards' Tower duplicators use a unique high-quality controller available only through Microboards. That's why Microboards always supports the latest record speeds and has the best track record in the industry! DVD PRM PRO-416RM Now available with up to four recorders in a single rackmount! Microboards' affordable, professional-level CD copying system is easy to use and fully contained, operating without being connected to a computer. DVD PRM PRO-516 Microboards' Premium DVD Copiers feature high-speed, industrial NEC recorders that copy both DVD and CD formats. In addition, Microboards' Tower duplicators use a unique high-quality controller available only through Microboards. That's why Microboards always supports the latest record speeds and has the best track record in the industry! DVD PRM PRO-716 Microboards' Premium DVD Copiers feature high-speed, industrial NEC recorders that copy both DVD and CD formats. In addition, Microboards' Tower duplicators use a unique high-quality controller available only through Microboards. That's why Microboards always supports the latest record speeds and has the best track record in the industry! DVD PRM-1016 Microboards' Premium DVD Copiers feature high-speed, industrial NEC recorders that copy both DVD and CD formats. In addition, Microboards' Tower duplicators use a unique high-quality controller available only through Microboards. That's why Microboards always supports the latest record speeds and has the best track record in the industry! DVD PRM-316 Microboards' Premium DVD Copiers feature high-speed, industrial NEC recorders that copy both DVD and CD formats. In addition, Microboards' Tower duplicators use a unique high-quality controller available only through Microboards. That's why Microboards always supports the latest record speeds and has the best track record in the industry! DVD PRM-516 Microboards' Premium DVD Copiers feature high-speed, industrial NEC recorders that copy both DVD and CD formats. In addition, Microboards' Tower duplicators use a unique high-quality controller available only through Microboards. That's why Microboards always supports the latest record speeds and has the best track record in the industry! DVD PRM-716 Microboards' Premium DVD Copiers feature high-speed, industrial NEC recorders that copy both DVD and CD formats. In addition, Microboards' Tower duplicators use a unique high-quality controller available only through Microboards. That's why Microboards always supports the latest record speeds and has the best track record in the industry! HCL-BD4000 Microboards Automated High Volume, 4 Drive 8X BDR, 2X RE, 16X DVD-/+R, 4X DVD-DL, 40X CD, RAM, 1,000 Disc Auto, 500GB HDD, 1,000 Disc Automated Duplicator, 500GB HDD, Black Let the Microboards HCL Autoloader handle the work load. With a state-of-the-art robotic arm. HCL-BD6000 Microboards Automated High Volume Blu-Ray 6 Drive 8X BDR, 2X RE, 16X DVD-/+R, 4X DVD-DL, 40X CD, 1,000 Disc Automated Duplicator, 500GB HDD, Black CFD-USB-07 Copy USB thumb drives in a flash with the Microboards CopyWriter USB Flash Duplicators. Making copies with the CopyWriter USB Flash Duplicator is easy; simply insert your master thumb drive, fill the remaining slots with blank devices, then press the OK button. Copying commences! QDL-1000-BD New from Microboards is the industry's most space-efficient automated Blu-Ray duplicator! Measuring in at just 9" high and 16" wide, the QDL-1000 Quic Disc Loader is the easiest way to automatically duplicate up to 25 discs at a time. The QDL-1000's reliable, robotic arm picks up discs from the lower tray, lifts them to the recording drive, and deposits finished discs in the output tray, ready for use. BD-121 Microboards' entry-level series of CD/DVD/Blu-ray duplicators is the QD Series, the economical way to make copies quickly. All duplicators are available in standalone 1, 3, 5, 7, or 10-drive systems, ensuring a perfect system for everyone. QDL-3000 With a small manageable footprint not much larger than a shoe box, the QDL-3000 fits in any office or cubicle and works unattended to make up to 60 copies per run. QDL-1000-02 New from Microboards is the industry's most space-efficient automated CD/DVD duplicator! Measuring in at just 9" high and 16" wide, the QDL-1000 Quic Disc Loader is the easiest way to automatically duplicate up to 25 discs at a time. The QDL-1000's reliable, robotic arm picks up discs from the lower tray, lifts them to the recording drive, and deposits finished CDs and DVDs in the output tray, ready for use. BD PROV3-04 The CopyWriter Blu-Ray series of tower duplicators employ 1, 4, 7, or 10 Blu-Ray disc recorders (6X) and a built-in 500GB hard disk drive to store master images. An intuitive, menu-driven display and 5-button control interface provide one-touch operation for the novice user while providing advanced features for the professional. BD PROV3-07 The CopyWriter Blu-Ray series of tower duplicators employ 1, 4, 7, or 10 Blu-Ray disc recorders (6X) and a built-in 500GB hard disk drive to store master images. An intuitive, menu-driven display and 5-button control interface provide one-touch operation for the novice user while providing advanced features for the professional. BD PROV3-10 The CopyWriter Blu-Ray series of tower duplicators employ 1, 4, 7, or 10 Blu-Ray disc recorders (6X) and a built-in 500GB hard disk drive to store master images. An intuitive, menu-driven display and 5-button control interface provide one-touch operation for the novice user while providing advanced features for the professional. Our Price: $1,599.00 CALL for our lowest price! Our Price: $2,349.00 CALL for our lowest price! NT BDPRV3-07 Record and duplicate CDs, DVDs, or Blu-ray Discs remotely over a local network using Microboards' Networkable CopyWriter Pro Series, featuring CD/DVD models and Blu-ray/CD/DVD models. NT BDPRV3-10 Record and duplicate CDs, DVDs, or Blu-ray Discs remotely over a local network using Microboards' Networkable CopyWriter Pro Series, featuring CD/DVD models and Blu-ray/CD/DVD models. NT DVDPRM PRO10 Record and duplicate CDs or DVDs discs remotely over a local network using Microboards' Networkable CopyWriter Pro Series, featuring CD/DVD models and Blu-ray/CD/DVD models. NT DVDPRM PRO5 Record and duplicate CDs or DVDs discs remotely over a local network using Microboards' Networkable CopyWriter Pro Series, featuring CD/DVD models and Blu-ray/CD/DVD models. NT DVDPRM PRO7 Record and duplicate CDs or DVDs discs remotely over a local network using Microboards' Networkable CopyWriter Pro Series, featuring CD/DVD models and Blu-ray/CD/DVD models.